If you are interested in the paper, you can find a pre-print version here. This study seeks to assess the implications of the social use of information and communication technologies (ICTs) for online political participation. Past research investigating the link between ICTs and political participation has emphasized the informational use of ICTs, overlooking their communication-enabling potentials for facilitating political talk in interpersonal spaces and subsequently, political participation in public domains. 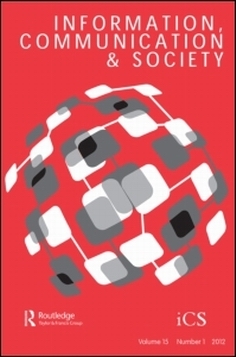 To understand further how ICTs as a means of communication may relate to political participation, we use data from the 2008 Taiwan Social Change Survey (N= 1076) to examine the relationship between the Internet and online political participation by looking at online media use for social interaction and engagement in civic talk online. Our findings suggest that interpersonal factors such as online civic talk and media multiplexity are positively associated with online political participation. Individuals who discuss politics with their friends via the Internet and those who use more types of online media for social interaction are more likely to contact legislators and elected officials directly via the Web and articulate their political thoughts in online public spaces such as forums, blogs, and websites of news media. We further offer an assessment of the findings’ implications for political participation, political communication, and digital inequality. I am very excited about this article since its turnaround was only 1 year! More importantly, we satisfied the requests from all FOUR reviewers over the year.